Microneedles, coated in DNA, could deliver a quick and painless vaccine. An innovative new way to deliver vaccines could drastically improve the health of the third world, and even the first world, by making vaccines cheaper and easier to distribute and use. The “vaccine patch” would be as easy to apply as a Band-Aid, and would be stable for weeks at room temperature.”You could potentially get a vaccine patch over the counter from your pharmacist, go home, and wear it for a couple minutes, then pull it off, and that’s your vaccine,” researcher Peter DeMuth told Business Insider. The patch differs from the nicotine and birth control patches currently in use. 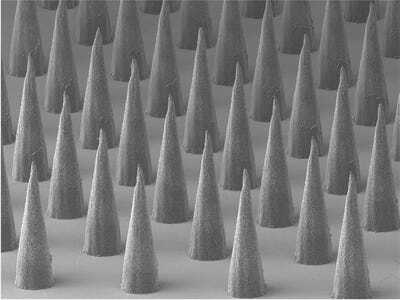 It uses tiny “microneedles” coated in DNA, which is deposited into the very outer layer of the skin. The needles are so small they are painless, they don’t pierce down to the level of blood vessels so there’s no bleeding, and no risk of infection. “What we’ve shown in the paper is that we can make these coatings in the right way we can apply the microneedle to the skin of the patient, for only 10 to 15 minutes, and then remove the needles and those coatings will be deposited into the skin,” DeMuth said. 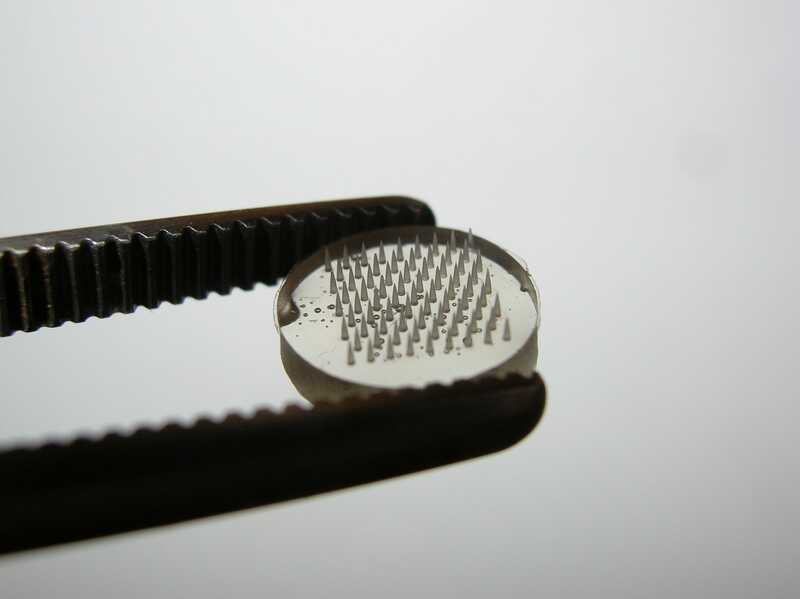 Multiple groups are working to design these microneedle vaccination patches. The most recent work was published in Jan. 27 in Nature Materials, and came from DeMuth, a graduate student at M.I.T in the lab of Darrell Irvine. DNA vaccines work by inserting strands of DNA, the molecule that holds the instructions that keep our bodies working, into the body’s cells. The DNA holds the code for a protein — a protein from a virus or bacteria, for example — which the body senses is foreign. “We just deliver the DNA and allow the cells of your body, the patient’s body, to produce those for us,” DeMuth said. The tiny needles are coated with vaccine, which they deposit into the outer layers of the skin. The body mounts an immune defence to this foreign protein, and this response is what protects us from that disease when it tries to invade us and sicken us — the immune system recognises the foreign protein and is able to vanquish the invading virus or bacteria before it gets a foothold in the body. Though they worked in small animals in the lab, previous attempts to make DNA vaccines failed when they reached monkey trials, but those vaccines were injected into the muscles, which isn’t the ideal place to mount an immune defence. In theory DNA vaccines worked, but it seemed as if the idea had hit an impasse. To make DNA vaccines work, researchers had to go back to the drawing board and think up new ways to administer the DNA. “DNA vaccines could make a big difference in the way we immunize people, but we are still kind of stuck at this place where it’s difficult to get human cells to take up DNA and express it as proteins in the same ways that small animal models do, ” DeMuth said. 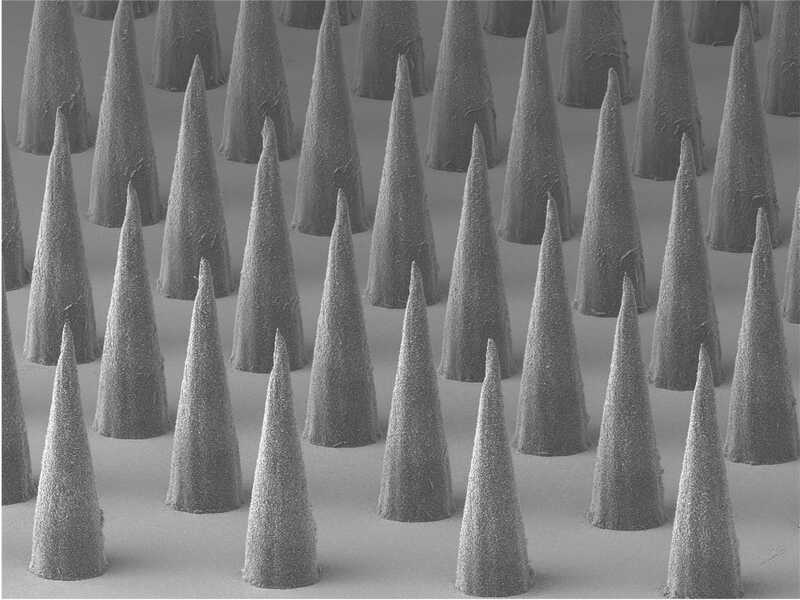 Microneedles half a millimetre tall. For the study, they tested a new way of applying vaccine — coating microneedles in DNA and having them pierce the outer layer of the skin, depositing the DNA package inside. They made these microneedles, which are half a millimetre long, into patches and checked out how effective they were in mice and monkeys.The needles can be coated in different layers which would change the way the vaccine is released into the skin — faster or slower, or even in a certain sequence. They tested mice and monkeys with a centimeter-wide circle of microneedles, applied directly to the skin. The skin is where our body is fighting off infections every day, so it’s full of disease fighting white blood cells that are primed to react to these foreign proteins. They saw this skin-based application really worked to improve the body’s reaction to the DNA vaccination. For the test, the needles were coated with the DNA that encodes a glowing protein from fireflies. If the DNA got into the animal’s cells and was expressed, then the skin should glow, which it did. The needles puncture the skin, depositing the vaccine. Then they had to check to see if the cells were making proteins that got into the blood and activated the immune system, which they checked using a protein from the monkey version of HIV, the virus that causes AIDS. They then checked the animal’s blood for evidence that it had reacted to the proteins, recognising them as foreign, which they had.”The good news is that all the studies up to now, in mice and in primates, have looked very promising, so the next step would be to verify this more robustly in primates,” DeMuth said. There’s still a lot of work left to do to get the patch working in humans and through clinical trials, but when approved, the patch vaccine will have plenty of advantages. First, DNA is easier to make in large quantities than proteins are. Secondly, once created, the patches don’t need to be refrigerated — they survive just fine for weeks on end at room temperature. This makes them easier and cheaper to transport and administer, especially in third-world countries where refrigeration is expensive and needles are incredibly dangerous. “DNA has the advantage that it could be potentially more stable for transportation for distribution throughout the world as a vaccine,” DeMuth said. That would drastically diminish the costs of immunizing against disease in third-world countries. “Those are the places you want vaccines to go and we need to find a way to eliminate that necessity for refrigeration if we are going to vaccinate those people who are most at risk,” DeMuth said. Third, the patches would remove the need for needles for application of vaccines. 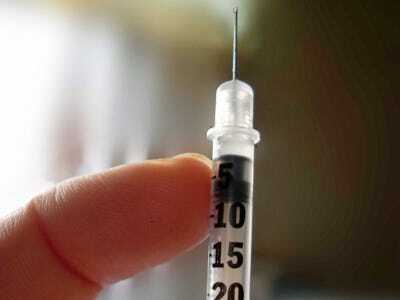 Needles spread disease because they are reused, are expensive, and require training to use. Needle puncture wounds can also get infected. Because the patch doesn’t breach the outer layers of the skin, it never reaches the blood vessels and would be much less likely to become infected.Also, using a DNA vaccine is much safer than vaccinating with a dead or mutated virus, as most traditional vaccines do. These could contain small amounts of live or healthy virus or bacteria that could cause infections. “For example, HIV is a virus, and the risk is if you would give that virus to a patient in a vaccine form, even if it is weakened, there is still the potential that you could actually cause infection as opposed to just eliciting the immunity you are looking for,” DeMuth told us. Another great thing about DNA vaccines? They can be made for almost any thing, including many of the diseases we already have vaccines for. DNA can be made that can create any protein — be it part of a virus, a bacteria, fungus, or even tumour cells. Just about any current vaccine could be changed into a DNA patch vaccine. The patch technology isn’t just for viruses and bacteria though, several researchers are also developing “vaccines” for things like cancer. These would train the body to recognise tumour cells by the kinds of proteins they made (some of which are different from the proteins in our normal body cells). “You can even develop a DNA vaccine that encoded a piece of protein that distinguishes tumour cells from self or healthy cells, and you could use that to immunize against cancer,” DeMuth said. As the technology improves, we should start seeing microneedle patch vaccines in human trials in about a decade.